So here's a vote for a guy who had unfortunate circumstances halt an unbelievable run as the most dangerous tight end in pro football. Winslow's selection stands here for the Gale Sayerses, Bo Jacksons and Terrell Davises of the world. From 1980 to 1984, no player was tougher to defend. You couldn't scheme Winslow. He was too athletic for linebackers and safeties, forcing teams to cover him with two DBs much of the time -- except he could beat bracket coverage with his size (6-foot-5) and leaping ability. The precursor to Shannon Sharpe, Rob Gronkowski and just about anyone else exploiting coverages today, Winslow made sweet music in the best passing attack in league history: Air Coryell. Competition at tight end: Wow, what a tough position to judge. Mike Ditka might be the most complete tight end in NFL history, having posted the finest rookie season ever by a player at the position in 1961: 1,076 yards and 12 touchdowns in 14 games. So many old-timers swear by John Mackey. Shannon Sharpe, who brought an incredible amount of upper-body strength to any press techniques defenses employed against him, owned the major records at this position before Tony Gonzalez broke them. Ozzie Newsome was every bit as good a player as he is an executive -- and that's saying something. Toughest cut: Shannon Sharpe (who was the most cut, so to speak, of anyone in consideration). "Forrest Gregg is the finest player I ever coached!" -- Vince Lombardi ... Seriously, do we even need to continue? Tough to top that endorsement, but it should be noted that Gregg is one of just three players who played on six championship teams in the NFL, winning five titles with the Packers and one as a reserve on the '71 Cowboys. In a career that touched three decades, Gregg could lock down anyone, including Deacon Jones. The Packers were a running team, no question, but Green Bay was known to take shots downfield on obvious running downs, like third-and-1. Gregg's task was to protect Bart Starr's blind side, which he did brilliantly in the 1960s. A seven-time first-team All-Pro, Gregg ranked behind only Anthony Muñoz and guard John Hannah among offensive linemen on The Sporting News' top-100 list. Competition at offensive tackle: Jonathan Ogden immediately sprang to mind. He's a newbie to the Hall, but that doesn't diminish his standing among the greats in the game. Status as a recent addition also shouldn't negatively reflect on a member of the Class of 2012, Willie Roaf, who retired as an extremely effective player -- even in his 13th year. The legendary Jim Parker kept guys off of Johnny Unitas, helping the Colts go back-to-back in 1958 and 1959. There have been so many phenomenal tackles in the 100-plus years of professional football, like Packers legend Cal Hubbard and Roosevelt Brown, a stalwart on the tough Giants teams of the late '50s. What about the Raiders' Art Shell? He was the '70s poster boy at this spot. Muñoz was an easy pick for the top tackle spot, though, as only Hannah poses a challenge in the argument of best O-lineman ever. And the fact that Gregg might have been the best player on a team that won five titles stands on its own. Toughest cuts: Jonathan Ogden, Jim Parker. Odd, isn't it? When you peruse this all-time offense, you don't see Troy Aikman, Emmitt Smith or Michael Irvin, the stars of the '90s Cowboys (which, of course, had as much success as any team in the Super Bowl era, collecting three Lombardi trophies in four years). Thing is, none of those guys were better at their respective positions than Allen was at his, whether he was playing guard or tackle. Frankly, left guard is where Allen made his biggest mark. The Sonoma State product could flat-out dominate an entire drive. Rather than listing Pro Bowls and All-Pro nods here, we supply a random series from a random game in the middle of L.A.'s career. Enjoy his pillaging of the Colts' front seven in the video above and to the right. Right around the time that Anthony Muñoz's career was getting going, people were beginning to think of Hannah as the greatest offensive lineman ever. Sports Illustrated anointed him as such in 1981, his ninth year in the NFL. The seven-time first-team All-Pro retired in 1985, despite still being arguably the best guard in football in his 13th year. His play just never seemed to diminish over time. Injuries briefly derailed Hannah in 1977, the only season of his last 10 in which he didn't earn a Pro Bowl nod. Hannah was an incredibly powerful blocker who excelled in both pass protection and, of course, classic run blocking. Competition at offensive guard: Hannah wasn't pushed -- he's the greatest. Allen's spot was a tad (or a ton) more difficult to decide on. Larry Little was as solid as any player on those fantastic Dolphins teams of the early 1970s. Dan Fortmann was a force on the Bears' line in the late '30s and early '40s, enough so to be named All-Pro in each of his last six seasons (despite barely weighing 200 pounds). It won't take Vikings fans long to yell out Randall McDaniel's name, as he was perhaps the most consistent player to play the position. Russ Grimm was pretty doggone good, too, and has three Super Bowl rings to show for it. Grimm was particularly effective on the Redskins' "counter trey." 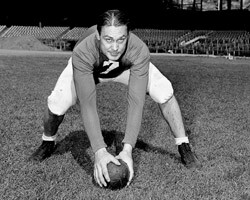 Another Packers legend from the '30s, Mike Michalske, got a long look. However, Allen's here because he simply manhandled the competition. This just might be the strongest player -- regardless of position -- ever to put on an NFL uniform. UPDATE: After publishing, I quickly received a lot of feedback on Bruce Matthews, perhaps the most versatile offensive lineman to ever play. While he was considered at guard -- the position he manned most often -- I felt that Allen and Hannah were more dominant in their prime. Toughest cuts: Larry Little, Mike Michalske. Take a look at photos of Mel Hein through the years. Arthur Daley, the legendary New York Times columnist, once opined that Hein played more minutes than any player in NFL history. Hein was a standout center, as well as an excellent D-lineman who at times played possum with opposing offenses (allowing certain plays to work early so he could shut them down when they were inevitably called again in crunch time). Truth is, Hein could read offense and play offense. He also stayed healthy, never missing a game in 15 years. (Bear in mind, he played in the toughest era of the NFL.) Hein was so steady -- and so frequently the best center in football -- that the Giants retired his No. 7. No New York Giant has worn that number in 68 years. Perhaps most impressively, Hein was the only center in the Pro Football Hall of Fame's inaugural class of 1963. Competition at center: Dwight Stephenson is the best center I've ever watched. Strong, steady and unwilling to let any of the interior linemen of the 1980s -- like Joe Klecko or Fred Smerlas -- touch Dan Marino. What a player. Jim Otto might be the most famous player to ever man the position, so much so that his number (00) is iconic in both Bay Area and NFL Films lore. Dermontti Dawson is probably the top player at this spot from the past 25 years. George Trafton played around Hein's era and took a seat next to him at the Hall in 1964. The Steelers' Mike Webster made the All-Decade Team of the 1970s and '80s, while the starter on that '70s team, Jim Langer, was yet another Dolphin Hall of Famer from the only perfect team in NFL history.